It has the potential to unlock billions in gleaming residential and commercial real estate projects and transform the Lynnway. But without it, there’s a chance development will stall. At issue is whether the MBTA’s River Works Station at the General Electric Co. plant on Western Avenue will open to the public. Today, the T only stops at the factory on the Newburyport/Rockport Line for GE employees. The Conn.-based corporate giant owns the station and the commuter rail picks up and drops off employees as a courtesy. The MBTA’s River Works station at the General Electric Co. plant on Western Avenue. At least two developers have more than a passing interest in turning the GE stop into a regular station with more frequent service. 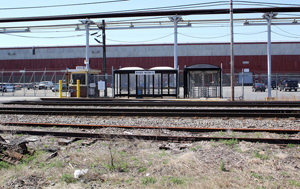 Swampscott developer Charles Patsios paid $7.6 million in 2014 to purchase the 65-acre former GE Gear Works property adjacent to the train stop. When completed, the $500 million complex will feature a 1,200-unit apartment tower, boutique retail, restaurants, a gym and new roads all within walking distance to bike trails, beaches and hopefully the T.
But to attract Millennials who are seeking an alternative to the exorbitant rents in Boston’s Seaport neighborhood where a tiny studio starts at $2,200 and a one-bedroom can cost as much as $6,500, Patsios needs the River Works Station. With a stop just outside the door of the complex, he can market the location of the luxury units as a 10-minute train ride to downtown Boston. “Expansion of the service is vital,” said Patsios. “With the train stop, this would be a truly transit-oriented development. It would bring young people with disposable income to the city. It’s transformative and ours is just one of many projects that could benefit by it. Joseph O’Donnell, founder of Boston Culinary Group and Belmont Capital in Cambridge, is developing a 17-acre site on the waterside of the Lynnway. O’Donnell’s associate, Charles Morneau, said they plan to commence construction next spring on a $69 million luxury apartment project that would include 250 units in a wood frame, three-story building. The key to the development is public transportation, he said. While State Transportation Secretary Stephanie Pollack is on board with expanding service at the station just off the Lynnway, making it a reality poses a number of obstacles. The stop, with its modest plexiglass shelters, is owned by GE. A spokesman for the company said they are in discussions with the state and the developer over expanding the station’s use. Still, it’s unclear what kind of improvements must be made to make the station accessible or whether the stop would be grandfathered and unaffected by the Americans with Disabilities Act regulations. At the very least, the station needs a platform. The new Yawkey Station near Fenway Park on the Worcester Line cost the state $15 million and the new station adjacent to New Balance’s Brighton headquarters cost about the same, but was paid for by the sneaker giant. Given the troubled financial shape of the T, Pollack said the state cannot pick up the tab for renovation of the station stop. Patsios said if he has to pay for the station at those numbers, it would be a deal killer. He said he’s already spending millions for new roads that lead up to the station and possibly a garage. At least one solution is being pursued. Jason Denoncourt, U.S. Rep. Seth Moulton’s economic development director, said the Lynn Economic Advancement and Development team, a group of city, state and federal officials who have a single mission of transforming Lynn, recently held a conference call with the U.S. Department of Transportation to discuss applying for a Transportation Investment Generating Economic Recovery (TIGER) grant. Since 2009, the competitive program has provided nearly $4.6 billion to 381 projects nationwide. The federal money leverages investment from the private sector, state, local governments and transit agencies. If approved, the cash would be used to upgrade the station. But getting the money is not guaranteed. The agency Department has received about 6,700 applications requesting more than $134 billion for transportation projects nationwide. They typically provide about $500 million annually. Lynn is planning to apply.